On November 2, The Guardian published a lenghty article about the Snowden-leaks, which said that besides the close intelligence-sharing group of the US, Britain, Canada, Australia and New-Zealand, known as 5-Eyes, there are also groups called 9-Eyes and 14-Eyes. According to The Guardian, the first consists of the 5-Eyes countries plus Denmark, France, the Netherlands and Norway and the latter adding another five European nations. This caused some embarrassment, as especially France and The Netherlands were heavily opposed to NSA's eavesdropping operations. For almost everyone the existance of these 'Eyes' came as a surprise, but as this article will show, there are also 3-, 4-, 6-, 7-, 8-, 9- and 10-Eyes communities. They were created for restricting access to military and intelligence information to respective numbers of coalition nations. These 'Eyes' are used as handling instructions and often supported by dedicated communication networks. "The NSA operates in close co-operation with four other English-speaking countries - the UK, Canada, Australia and New Zealand - sharing raw intelligence, funding, technical systems and personnel. Their top level collective is known as the '5-Eyes'. Beyond that, the NSA has other coalitions, although intelligence-sharing is more restricted for the additional partners: the 9-Eyes, which adds Denmark, France, the Netherlands and Norway; the 14-Eyes, including Germany, Belgium, Italy, Spain and Sweden; and 41-Eyes, adding in others in the allied coalition in Afghanistan." "More limited cooperation occurs with many more countries, including formal arrangements called Nine Eyes and 14 Eyes and Nacsi, an alliance of the agencies of 26 NATO countries". "The Five Eyes sigint community also plays a ‘core’ role in a larger galaxy of sigint organizations found in established democratic states, both west and east. Five Eyes ‘plus’ gatherings in the west include Canada’s NATO allies and important non-NATO partners such as Sweden. To the east, a Pacific version of the Five Eyes ‘plus’ grouping includes, among others, Singapore and South Korea. Such extensions add ‘reach’ and ‘layering’ to Five Eyes sigint capabilities." This text suggests that there are several western Five Eyes 'plus' groups, one of which sounds like the 14-Eyes mentioned by The Guardian. The eastern Five Eyes 'plus' refers to the 10-Eyes group, which will be described down below. The term 9-Eyes could already be found in some other sources. One is an extensive article by the French weblog Zone d'Intérêt about the NATO exercise Empire Challenge 2008 (EC08), in which a number of operational and testing networks were used. One of them is the Combined Federated Battle Laboratories Network (CFBLNet), which is for research, development and testing on command, control, communication, computer, intelligence, surveillance and reconnaissance (C4ISR) systems. - The CFBLNet Unclassified Enclave (CUE), which is unclassified, but traffic is secured using 128 bit Advanced Encryption Standard (AES) encryption. - The Four-Eyes Enclave (FEE), which is a classified enclave at the SECRET level, accessible for USA, GBR, CAN and AUS only. This enclave was moved from behind the BLUE enclave to the Blackbone in 2006. - The 9-Eyes or NATO RED Enclave, which is also a classified enclave at the SECRET level, accessible for the NATO members of the Five Eyes plus France, Germany, Italy, Spain, The Netherlands and Norway. This enclave was established in 2006 for classified initiatives among NATO members. - The Initiative Enclaves, which are created temporarily to support specific initiatives and are classified according to the initiative requirements. This table lists the groups of nations to which some specific multi-national intelligence and reconnaissance information can be released. This is shown by using the dissemination markings or handling instructions: REL NATO, REL 4-EYES, REL 9-EYES. The famous Five Eyes term also has its origins in the former NSA dissemination marking EYES ONLY, which defined which 'eyes' may see certain material. Accordingly, documents authorized for release to the five UKUSA-countries were initially marked as AUS/CAN/NZ/UK/US EYES ONLY. In conversations, allied intelligence personnel adopted the term "Five Eyes" as a shorthand because it was much easier to say. This term became widely used and even got its own abbreviation: FVEY, which is now used in REL FVEY, after the EYES ONLY marking was being replaced by the REL TO [country/coalition designator] format. From the European NATO countries, France, The Netherlands and Norway are in both lists. The Guardian adds Denmark and the non-NATO members of the Five Eyes, which leaves Germany, Italy and Spain out. Especially Germany and Italy not being included in this apparently close alliance seems strange, as both countries participate in other coalition groups and are both considered to be 3rd party partners of NSA. Maybe this explains Germany being "a little grumpy at not being invited to join the 9-Eyes group" as The Guardian read in GCHQ documents. Unfortunately, The Guardian failed to provide any context or even a time period for their 9-Eyes and 14-Eyes listings, which makes it quite difficult to find an explanation for the different membership countries of these groups. At first sight it seems there are two different 9-Eyes groups: one apparently closely related to NSA, and another one as a sharing group in the CFBLNet environment. But as 9-Eyes is used as a handling instruction for classified information, it has to be perfectly clear to which group of countries information marked REL 9-EYES may be released. Therefore we have to assume there can be only one 9-Eyes group at a time. 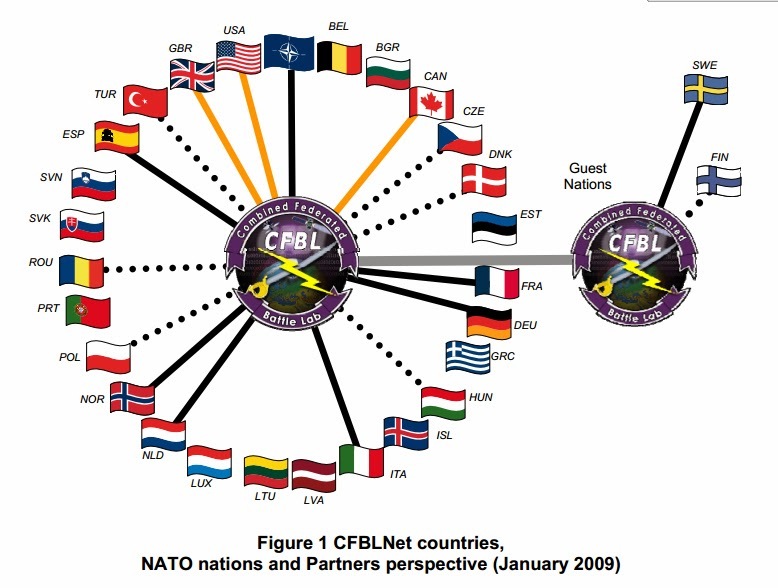 The 9-Eyes NATO group of the CFBL network was first mentioned in 2008 and still comprised the same nations in 2012. In the meantime, Sweden also became a full member of CFBLNet, but not being a NATO member, it wasn't included in the 9-Eyes sharing group. One option to explain the differences between the two 9-Eyes could be changing membership, with countries added or removed on an annual basis depending on their participation in the CFBLNet. But this also wouldn't fit with the Guardian's list, as Australia and New Zealand are no NATO-members and Denmark is not a fully participating member nation of the CFBL network. 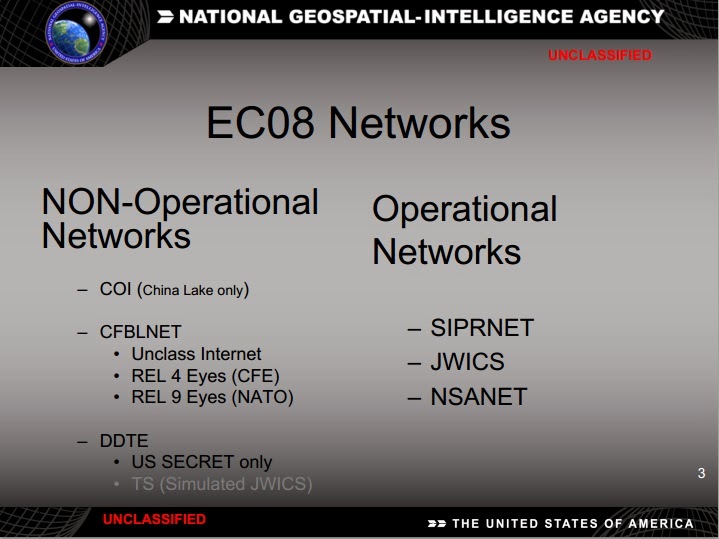 Unless The Guardian misinterpreted the Snowden-documents, it seems quite unlikely that their 9-Eyes could be the same as the NATO 9-Eyes on the CFBL network, but it seems also unlikely that there are two groups called 9-Eyes at the same time. The best guess at this moment would be that the Guardian's 9-Eyes was a group that only existed somewhere before the NATO group was formed. From remarks made on Twitter by a Dutch journalist who works on the Snowden-papers, it seems that the 9-Eyes is a group for exchanging military signals intelligence related to operations in Afghanistan. There's also the Multinational Interoperability Council (MIC), which is a forum for identifying interoperability issues and articulating actions to enhance coalition operations. It started in 1999 as the Six Nation Council and now has seven members: the US, Canada, Australia, Britain, France, Germany and Italy. It might be this group which is called 7-Eyes. Also interesting is Alliance Base, which was the cover name for a secret Counterterrorist Intelligence Center (CTIC) that existed between 2002 and 2009. It was based in Paris and was a cooperation between six countries: the US, Canada, Australia, Britain, France and Germany. There's no indication this group was designated by a number of 'Eyes'. These lists are very similar, except that Denmark and Belgium, which are on the Guardian's list, are not a (full) member of CFBLNet. Maybe these two countries joined CFBLNet only very recently, and in that case the 14-Eyes could refer to this group. It does show though that these NATO countries (and Sweden) are cooperating in additional information-sharing initiatives. The exact purpose of such a cooperation in the 14-Eyes group isn't clear. The New York Times only says that the nations comprising the 9-Eyes and 14-Eyes groups have formal arrangements with NSA, which is something that also makes a country a traditional 3rd party partner. According to Snowden-documents, about 30 countries have this status, but so far only the names of Germany, France, Austria, Denmark, Belgium and Poland were published. Some other sources say that Norway, Italy, Greece, Turkey, Thailand, Malaysia, Singapore, Japan, South-Korea, Taiwan, Israel and South Africa are 3rd party partners too. If we compare this to the 14-Eyes, we see that only France, Germany, Norway, Italy, Belgium and probably Spain are known 3rd party partners. Sweden, Denmark and The Netherlands are not, but it's assumed they had or have less formal arrangements for exchanging SIGINT and cryptologic information with NSA. This also applies to Finland and Taiwan, and therefore these countries are sometimes called 4th party partners. A. All countries of the 14-Eyes (and subsequently those of the 9-Eyes) are actually 3rd party partners, because of having formal arrangements with NSA. Which means Sweden, Denmark and The Netherlands must have acquired that position in recent years. Grouping them in two 'Eyes' would only make sense if that's for some specific initiatives. B. Countries belonging to the 9-Eyes and 14-Eyes have a more close relationship with NSA and are therefore somewhere in between the 2nd party and the 3rd party nations. This is what both papers suggest, but it seems not very likely that relationships like these allow that much of (formal) refinement. C. The 9-Eyes and 14-Eyes are groups created for specific goals and consist of the Five Eyes with some additional 3rd and 4th party nations, depending on whether their participation is needed for achieving those goals. In 2010, France was apperently ready to join the Five Eyes, but at the last moment the Obama White House said no. The Combined Federated Battle Laboratories Network (CFBL or CFBLNet) is a distributed Wide Area Network (WAN), which allows for the testing of new multinational information-sharing capabilities before they're transitioned to the actual operational networks which are used worldwide to support Combatant Command operations. CFBLNet enables the sharing and exchange of information on experimentation and interoperability testing. Each member nation operates several "Battle Lab" sites which are hook into the CFBLNet backbone at a national Point-of-Presence (PoP). In 2012 there were 247 sites divided over 12 countries. The backbone traffic is secured with TCE621 (in Europe) and TACLANE E100 (or KG-175 in the US) network encryptors. The Multinational Information Sharing Program Management Office (MNIS PMO) maintains day-to-day control and coordination of the network. Every year, also several other NATO countries participate or observe as guest nations in one or more CFBLNet initiatives at existing lab sites. The CFBLNet grew out the network designed to support the US Joint Warfighter Interoperability Demonstrations (JWID), which used to build a support network for the period of the demonstrations and tear it down afterwards. 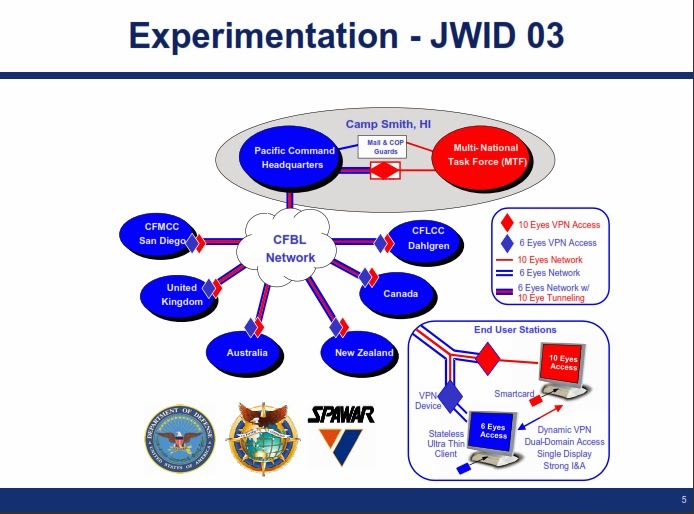 In 1999, the JWID exercise used, for the first time, a permanent infrastructure that became what is now called the Combined Federated Battle Lab Network (CFBLNet), as established by the NATO Consultation, Command and Control Board (NC3B) in 2001. Creating separate access groups for coalition operations, and describing them with a certain number of 'Eyes' can be traced back to the early years of this century. The first occasion seems to have been the Joint Warrior Interoperability Demonstration 2003 in which also non-traditional partner countries were added to the communications network used by the UKUSA and NATO coalition. 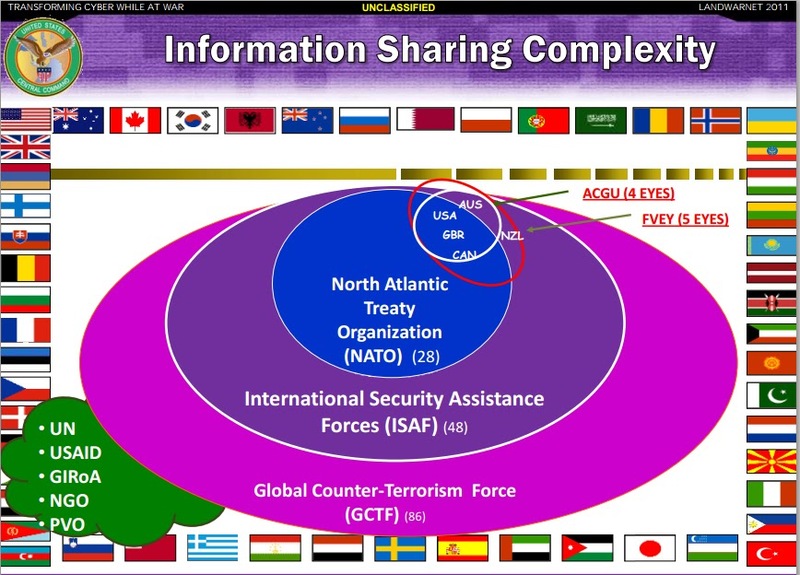 Information sharing between different groups of coalition partners required that separate domains had to be created within one network: in 2003, the 5-Eyes countries and the NATO organization comprised the 6-Eyes domain, while these six members plus four Pacific Rim nations (Japan, South Korea, Thailand and Singapore) comprised the 10-Eyes domain. Each domain had its own Type-2/3DES-encrypted Virtual Private Network (VPN) which ran over a network secured by classified Type-1 encryption algorithms. The 2004 edition of the Joint Warfighter Interoperability Demonstration also involved South-Korea, officially known as the Republic of Korea (ROK). To this end, three separate domains within CFBLNet were created and organized into two classification levels named 6-Eyes and 8-Eyes. The 8-Eyes domain consisted of the 6-Eyes countries plus NATO and ROK. The ROK domain was cryptographically isolated from the rest of CFBLNet by using TACLANE encryptors with Type-1 algorithms. The long-standing and close intelligence-sharing community of the Five Eyes was downsized on two occasions. First in 1985, when New Zealand refused US nuclear-armed or nuclear-powered ships to visit its ports. As a result, the island was cut out of most intelligence arrangements led by the US. Some SIGINT was still being shared, but New Zealand got no American HUMINT or military intelligence anymore, except for operations in which it's actually participating. For information sharing and exchange between these nations, there's also a separate network codenamed STONEGHOST, which is maintained by the US Defense Intelligence Agency (DIA). This network was previously called Intelink-C, which runs over it, and is now sometimes referred to as Q-Lat or Quad link. Information restricted to the 4-Eyes partners is marked with their respective country codes or the abbreviation thereof: ACGU. For collaborative planning at the strategic level there's another network called Pegasus (until 2010: GRIFFIN), which provides secure e-mail, chat and VoSIP communications for the 5-Eyes partners, as the military cooperation between the US and New Zealand was restored again in 2007. Probably by then, a separate network called CENTRIXS-NZ was set up, which connects the Four Eyes with New Zealand. Sharing intelligence information between the US and the Five Eyes is done through NSANet, which is a TS/SCI network controlled by NSA. Another sub-group of the Five Eyes was formed when Canada didn't join the US in the 2003 war against Iraq. With New Zealand also not formally engaging, the 5-Eyes were now reduced to just 3-Eyes: the United States, Great Britain and Australia. The relationship between these three countries became closer as both Britain and Australia were granted an upgrade of their intelligence access by president George W. Bush: both countries were granted (temporary and limited) access to America's classified SIPRNet for certain joint missions. This also reflects their bigger SIGINT collecting capabilities, compared to those of Canada and New Zealand. - CENTRIXS Four Eyes (CFE) for the US, Britain, Canada and Australia. - CENTRIXS-NZ for the Four Eyes plus New Zealand. - CENTRIXS-JPN for the United States and Japan. - CENTRIXS-K for the United States and South-Korea. - CENTRIXS-PHI for the United States and the Philippines. - CENTRIXS-CNFC for the Combined Naval Forces CENTCOM (VPN within GCTF). - CENTRIXS-MCFI for the Multinational Coalition Forces Iraq. - CENTRIXS-ISAF (CX-I) which is the US component of the Afghan Mission Network to share critical battlefield information among 50 coalition partners. - CENTRIXS-GCTF (CX-G) for the Global Counter Terrorism Forces, which is the US coalition network in Afghanistan to share information among more than 80 Troop Contributing Nations. The countries connected to CENTRIXS-ISAF can be recognized as the 41-Eyes of the allied coalition in Afghanistan mentioned by The Guardian. This group grew slowly and was called 43-Eyes in 2010, when the NATO exercise Empire Challenge 2010 (EC10) changed its "main participating security domain" to "an International Security Assistance Forces (ISAF) equivalent 43-Eyes domain". Probably also because of the steadily increasing number of coalition partners, shareable information is not marked with REL [..] EYES anymore, but with REL ISAF and REL GCTF. We have seen that designations consisting of a number of 'Eyes' are used as a dissemination marking or handling instruction showing among which group of countries specific military or intelligence information may be shared. The Guardian and the New York Times listed various 'Eyes' and some other groups in a way that suggests a hierarchy of how close their relationship with NSA would be: first the Five Eyes community, followed by 9-Eyes, 14-Eyes, NACSI, and with the 41-Eyes Afghanistan coalition being the loosest kind of cooperation. A scheme like this looks attractive, but is at least partially misleading. For sure the Five Eyes are cooperating in the closest way, but the other groups have different scopes. NACSI is more like an advisory working group of NATO than an alliance of signal intelligence agencies, and the 41/43-Eyes community is for sharing battlefield information between members of the Afghanistan coalition. Regarding the 9-Eyes and 14-Eyes communities, it's now up to journalists who have access to the Snowden-documents to provide more detailed information about whether they really represent more close alliances with NSA, or whether they're just 'working groups' of selected 3rd and 4th party nations, like most of the other 'Eyes' communities. Very helpful article that pulls together highly scattered information. Over and over we see journalists not really understanding what they have and self-censoring to the point no one else can figure it out either: "the Guardian failed to provide any context or even a time period for their 9-Eyes and 14-Eyes listings..."
"all decryption is carried out by PTD [Penetrating Target Defense] (ARTHUR) processing with decrypts going to the IIB in the NOCON COI; some decrypts are placed in the ENDUE COI due to sensitivity or fragility of the exploitation capability." Each collection of 'Eyes' has an associated database or wiki that anyone read in to that network can access. For FVEY, that database has codename STONEGHOST. Do we know the others? It's significant because the access perimeter of leakers generally amounts to a certain level of 'Eye' repository, fewer 'EYES' meaning greater sensitivity. For example, STONEGHOST was copied over to the GRU in its entirety through January 2012 by a Canadian analyst, Royal Canadian Navy Sub-Lieutenant Jeffery Delisle. He did not retain a copy and Russians have not publicly released these files. Thus if all that Snowden took was FVEY, there is no significance to it whatsoever -- it was already out in the wild. Might want to expand on the special relationship to Israel. It looks like NSA shares more with them than any other country than the UK. Maybe everything, routinely -- I've not seen any document control abbreviation like FVEY for Israel. And this despite the USS Liberty 'incident'. It's not clear how symmetric that sharing is, though Israel did supply NSA with their telecom fiber optic splitting devices eg Narus and collaborate on Stuxnet and Flame malware. "The National Security Agency routinely shares raw intelligence data with Israel without first sifting it to remove information about US citizens, a top-secret document provided to the Guardian by whistleblower Edward Snowden reveals. Details of the intelligence-sharing agreement are laid out in a memorandum of understanding between the NSA and its Israeli counterpart that shows the US government handed over intercepted communications likely to contain phone calls and emails of American citizens. The agreement places no legally binding limits on the use of the data by the Israelis..."
Thank you for mentioning STONEGHOST, I forgot to refer to it in the article, but I will look for some extra information and then add something about it. That STONEGHOST data were already passed to the Russians by Jeffery Delisle, means that probably most of the Snowden-leaks are not new anymore for Russian intelligence. So it's likely they weren't directing Snowden, as some people suspect. Information shared with Israel is just marked: REL TO USA, ISR - as we can see from the Memorandum of Understanding published by the Guardian. Based upon that document, Israel is considered to be a 3rd party partner, but the actual importance of these kind of countries can be different in scope and in time, depending on things like the current political situation and specific information needs (like nearby wars in Iraq or Syria). Because the importance of these bilateral relationships change frequently, it seems to me that it's not very realistic to see this being formalized in so many different levels as the Guardian and the New York Times seem to suggest. The 'Eyes' article is fine as far as it goes but does not explore how distribution headers are implemented operationally, which is critical to understanding leakage. Thus if an article newly developed by NSA is marked FVEY, is a pdf attachement then emailed about to every agency staffer and contractor vetted to FVEY in the respective five countries? Is there an RSS alerting feed so that each analyst is notified that a report on such-and-such is now available? I think not. Instead, the report would simply be deposited in the FVEY electronic file cabinet called STONEGHOST, which is further partitioned into sub-categories of clearance refinement, sometimes by section within a single document. For example, the 2008 GCHQ document on "Al Qaida's Constraints and Vulnerabilities" accidentally left on a commuter train seat by civil servant Richard Jackson (and turned over to BBC by a fellow commuter) is labelled UK TOP SECRET STRAP1 CAN/AUS/UK/US EYES ONLY. In terms of GHCQ PMI (Protectively Marked Information), FVEY etc are called the nationality caveat, a descriptor defining which nationality groups it may be released to. Here, as usual, NZ analysts are shut out entirely as STONEGHOST has a virtual Four Eyes partition, but a British analyst at GCHQ with top secret clearance still could not access it by keyword search of STONEGHOST without additional STRAP1 clearance. Meanwhile NSA would not use the STRAP caveat at all but rather an unrelated COI or ECI tag -- or nothing. Here "STRAP is a collective term for a set of nationally (UK) approved principles and procedures for enhanced need-to-know protection of sensitive intelligence and relaed operational information [that is] accepted by the US Intelligence and DoD community as the mechanism by which highly sensitive US intelligence material is controlled when in UK Government hands." STRAP1 is apparently the lowest of the three STRAP categoies (1-3). The only Snowden document to date with a STRAP1 classification provides "Real Life Stats from GPRS work [3 lines blacked out] Diplomatic targets from all nations have an MO of using smartphones. Exloited this use at the G20 meetings last year." For cryptography, especially decryption of internet protocols, TOP SECRET STRAP2 COMINT BULLRUN AUSCANZUKUS EYES" appears in the " Summary of BULLRUN Program", another Snowden release of a GCHQ-originated document. Since STRAP is a UK security classification (STRategic Action Plan), it is not clear whether it just restricts UK analysts or whether a Canadian like the Russian spy Delisle with merely top secret clearance could also access it. There is no mechanism by which a foreigner such as Delisle could be get 'developed vetting' for STRAP1 yet there is no known mapping of STRAP into enhanced security classifications of other EYES. Thus it is baffling exactly how GHCQ controls its STRAPed submissions to the STONEGHOST database -- surely they don't allow the Snowdens and Delisles of other nations more access that most of their own analysts get. I have same question for NSA-originated FVEY submissions with additional COI or ECI markups -- how are they restricted in say Australia without a mapping of access terminology across the national caveats? The Defense Intelligence Agency (DIA-US) released a slide showing where STONEGHOST servers sit within their Multi-Domain Dissemination system -- downstream for a trusted high-to-low security releaser. For its part NSA released a slide of 6 separate computers facing one analyst's chair: NIPRnet, STONEGHOST, SIPRNet, CENTRIXs, JWICS, and REL UK. You are right about the dissemination markings like REL TO FVEY. I noticed some people and media thinking these prescribe some active distribution among all countries mentioned, but that's not the case. These markings only say that the material is authorized for release to those countries when there's a need-to-know that specific information. Thank you for the extra info about STRAP, I will prepare a separate article about that. I don't know whether the STRAP-documents from Snowden were actually taken from STONEGHOST. It seems not very likely, because STRAP is generally not releasable to foreigners, and also because STONEGHOST only contains information up to the SECRET REL [country code] level. Journalists should definitely provide more details about how and where Snowden took all these documents. Nice list of 3rd Parties, P/K ! - Mexico : "The CIA is reported to cooperate closely with the Federal Directorate of Security, which is said to tap telephone calls by some Soviet-Bloc embassy staff and send the transcripts to the CIA." Thank you for these additions! A country is considered a 3rd party if there's a formal SIGINT exchange agreement between the signals intelligence agencies of both nations. - share intelligence in the form of finished reports. This happens with many countries on a less formal basis and whenever there's a need to do so. you access towards Internet as if you were using the net in america.